Saigon is a jigsaw puzzle, a mosaic of districts, either named or numbered, with each of those broken down into smaller wards denoted by name or number again. As the largest city in Vietnam, and one of the largest cities in Southeast Asia, choosing which area to base yourself in, either for a vacation or to live and work, can be a daunting task. Of course, most tourists will, quite understandably, flock to District 1, drawn to the hotels and bed & breakfasts that surround the main attractions such as the Reunification Palace or the famous Ben Thanh Market. But Saigon has so much more to offer than a square kilometre or two of postcard-friendly sights. For those who choose to confine themselves to the tourist-friendly part of town, you risk missing out on the best this energetic metropolis has to offer. Here is our guide to the most central of Saigon’s 24 districts, each harbouring its own distinct vibe, its own secrets, and its own small piece of the puzzle. The big one, the point from which Saigon grew from being a sleepy riverside settlement to what it is today. District 1 is (very roughly) an upturned ‘L’ shape, with the backpacker district in the far south end; the old town, the downtown and financial areas in the middle, and a cluster of more local, more sedate neighbourhoods in the north. The backpacker area, which revolves around Pham Ngu Lao Street and Bui Vien Street, is home to hundreds of hotels, guesthouses and hostels of varying degrees of comfort, quality and price. Despite its nickname, and particularly when you move a block or two away from the main strip, it’s an ideal base for tourists of any budget or travelling style, backpackers, flashpackers or otherwise. Bui Vien is the centre of the nightlife scene here, offering genuinely good quality restaurants, cheap bars and lively clubs, all geared towards the tourist market. Naturally, it has a reputation as something of a party street, although the whole area has significantly cleaned up its act in recent years. Still, where there are tourists, there is money, and where there is money there are people willing to take it from you, legally or otherwise. On the whole, Bui Vien is fun and generally safe, but do beware of pickpockets, bag snatchers and scams. Like most places, online review sites are the best way of knowing where to go, and where to avoid. By the same token, the backpacker area is, in many peoples’ opinions, not the best place to choose if you’re planning a longer, more permanent stay in the city. No matter how long you’ve been there, no matter how much of the language and the culture you manage to get your head around, you will forever be a naive tourist in the eyes of the locals… and, as you will soon realise, you will forever be surrounded by actual tourists. At the centre of our upturned ‘L’ lies the downtown area. Marked by several major sights including the resplendent Hotel de Ville—the old French town hall now known as the People’s Committee Building — and the long ‘walking street’ of Nguyen Hue which stretches out from it, a hotel in this area offers easy access to all parts of District 1 and beyond. Prices are a little higher than the backpacker zone, but still low compared to accommodation in the US or Europe, for example. The major streets for sight-seeing, nightlife, shopping and dining in this area are: Dong Khoi, Pasteur, Ly Tu Trong, Le Thanh Ton and Hai Ba Trung. This part of D1 is also home to some of the most expensive shops in the city like Chanel, Louis Vuitton and Ralph Lauren. Naturally, then, real estate here is some of the priciest in town, although bargains can be found if you’re looking to live in the centre of the action. At the far north end of Ha Ba Trung Street, still in District 1, lies the neighbourhood of Dakao, otherwise known as the consulate zone (being home to several foreign Consul Generals and their offices). Dakao is also emerging as a fairly trendy part of town, boasting several top-rated restaurants and cafes which are well worth checking out. Beyond Dakao is Tan Dinh, marked by its large indoor market on Hai Ba Trung Street. To see a local Saigon market in action, skip Ben Thanh and head here. Nguyen Hue Street – A pedestrianised boulevard running from the People’s Committee Building all the way to the river. Since opening in 2015, Nguyen Hue has become a hive of activity come nightfall as the locals arrive to hang out with friends, ride on rented hover-boards, or grab ice creams and snacks from the various shops and food trucks in the adjoining side streets. 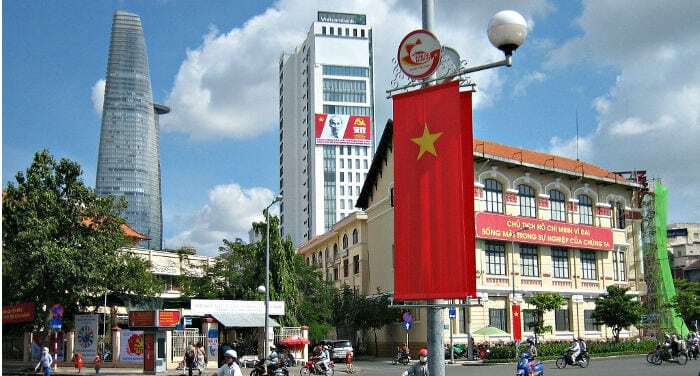 Le Thanh Ton Street – From the junction with Ton Duc Thang Street to the crossroads of Hai Ba Trung, this strip of Saigon is commonly known as ‘Japan Town’ owing to the large Japanese community that call this area home. Bars, restaurants, spas, grocery stores and winding back alleys are about as authentically Japanese as you can get without flying to Tokyo. After sunset, it’s a fun, vibrant part of town to explore while enjoying a different side to Saigon’s nightlife. Tao Dan Park – What is, essentially, the back garden of the Reunification Palace, is a large and lively open green space and one of the city’s best public parks. With various pockets of activity taking place throughout the day, a stroll around Tao Dan is like taking a stroll through the everyday lives of the locals. Early mornings are recommended however, when the weather is cool and the local neighbourhood is out practicing tai chi, whirring away on the public fitness equipment, or simply enjoying a coffee at the park’s cafe. Saigon Centre, Le Loi Boulevard – Opened in 2016, this is, at the time of writing, Saigon’s premier shopping and entertainment destination. Packed with local and foreign brands plus a dazzling lineup of dining options in the basement food court or in the top floor restaurant zone. Kids can let off steam in TiNiWorld, an indoor supervised play centre, while parents indulge in some ultra-modern retail therapy. Contrary to many visitor’s assumptions, the numbering system used to denote Saigon’s districts is not entirely formulaic. 50 years ago however, District 2 did indeed sit next to District 1, as you might expect. But as the size and spread of the city boomed from the 1990s onwards, the ‘old’ District 2 was integrated into District 1 (hence the two-part ‘L’ shape we see now), and the title of the ‘new’ District 2 was given to the former swamp land on the opposite bank of the Saigon River. Certain parts of this area are still under development, the wetlands and greenery slowly disappearing beneath concrete, however the north end of District 2 has been alive and kicking for several decades now. Known as Thao Dien, with the river curving above it and the Hanoi Highway running below, this segment of District 2 has become one of the two most popular areas for expat families to settle in Ho Chi Minh City, having gone from a sleepy rural village to a booming land of restaurants, malls, international schools and high-rise tower blocks. While it may lack the buzz and energy of District 1, Thao Dien retains a unique, laid-back charm, where streets lined with organic supermarkets, burger joints, sports bars and Starbucks, rub shoulders with more traditional avenues of street food restaurants, banh mi sellers and buzzing roadside food markets. Many foreigners living in District 2, proudly or not, will tell you how infrequently they actually make the short hop over the river to D1. With taxi journeys into the centre of town taking approximately 20 to 30 minutes from here, and costing around VND120,000 (US$5.50), it’s perhaps easy to see why Thao Dien has the reputation for being an expat bubble. That’s not to say you really need to leave D2 these days; many restaurants from the centre of town have opened branches in Thao Dien over the past year, with new supermarkets, malls, spas, gyms and cinemas popping up on a regular basis as the area’s population swells. For tourists, particularly those visiting Vietnam for the first time, D2 is perhaps a little too removed from the action. For a break from the chaos of the downtown area, however, Thao Dien is well worth a day or so out of your trip. Begin your visit by heading to Thao Dien Village (189 – 197 Nguyen Van Huong Street), a spa, hotel, restaurant, gym and swimming pool complex set on the breezy banks of the river. Day guests are welcome, and a lazy morning by the pool is the perfect antidote to D1’s fumes and noise. The main street (also called Thao Dien) is home to numerous restaurants and bars, along with Xuan Thuy Street which dissects it. For a glimpse into what life as an expat in D2 can offer, head to Saigon Outcast, an open-air bar, restaurant and event space at 188 Nguyen Van Huong. Whether it’s live music events, flea markets, cinema screenings or craft beer festivals, there’s always something to see here. There’s even a climbing wall and skate park. BiaCraft Artisan Ales, 90 Xuan Thuy Street, Thao Dien – One of the forerunners in Saigon’s craft beer revolution, this bar is stocked full of locally produced, flavour-packed beers and ciders, both on tap and in bottles. The food menu is short but meaty, offering a small range of hot dogs, fries and bar snacks. It’s places like this that keep the D2 crowd from straying. The Deck, 38 Nguyen U Di, Thao Dien – There aren’t many bars in Saigon, let alone the world, that will come and pick you up by speedboat and drop you at their door. The Deck does. From a pontoon downtown, and with advanced booking only, they’ll whizz you around the river to their uber-luxurious riverside perch. As the waters glide by beneath you, enjoy world-class cocktails, delicious wines, and some of the finest cuisine in the city. Family Garden, 28 Thao Dien, Thao Dien – Proof that District 2 is about more than just eating and drinking, Family Garden offers kids (and their parents) a place to get in touch with nature (which can be difficult in such an urbanised environment). With vegetable patches, flower beds and a few small animals to pet, kids are encouraged to get their hands dirty and learn about where their food comes from. Families are welcome to drop by, or enrol their young ones into the playgroup. Saigon’s third district is home to numerous hotels, restaurants, bars, cafes and attractions, however given it’s apparent removal from District 1, many simply overlook it. In truth, the two sit next-door to each other, and many areas of the D3 make ideal bases from which to explore the whole city. Being just that slightest bit removed from the tourist zone, this is also a perfect place to see the ‘real’ Saigon at work and get a taste of life as a local. For eats and drinks, head to Ngo Thoi Nhiem Street, a long but narrow road running from Nam Ky Khoi Nghia to Cach Mang Thang 8 Street. Dotted with pretty outdoor courtyard restaurants, like Khoi Thom, at number 29, one of the best Mexican restaurants in the city, or funky bars and music venues like Acoustic at 6E. Nguyen Dinh Chieu Street and Vo Van Tan Street both run the entire length of the district, east to west, and are a kaleidoscope of noise, colour and activity. From shopping areas to temples, markets, restaurants, cafes and mansions, they both give a flavour of local life all laid out in two parallel streets. The alleyways between them can also throw up a few surprises, such as a secret weapons bunker, and high-end boutique clothes shops. Turtle Lake – Situated behind the famous Notre Dame Cathedral (in District 1), Turtle Lake marks D3’s eastern boundary. Some may be disappointed to learn that the lake is not named after the wildlife that inhabit it (turtle population = zero), but after a statue that once stood here. Ringed with cafes and restaurants, the lake is a magnet for Saigon’s youth who come to hang out after sundown and relax with friends on the lake’s edge. Bo La Lot Co Lien – 321 Vo Van Tan. Bo la lot, a dish of ground beef wrapped in betel leaves, is famous all over Vietnam. Mrs Lien’s version is considered by many to be the best in town. Now used to seeing the odd foreign face or two, staff are happy to help demonstrate the best way to eat bo la lot, just don’t forget the incredible dipping sauce – a mixture of fish sauce and pineapple juice. After you’ve eaten, head down the backstreet beside Mrs Lien’s restaurant – it’s usually filled with the sights, sounds and smells that make Saigon so unique. Until the station was moved further out of town, this narrow road once rumbled with the sounds of trains, the tracks running right down the middle and into the centre of District 1. Sitting along District 1’s south eastern flank, triangular District 4 occupies its own small ‘island’ formed by the Saigon River on one side and two converging canals on the other. With water all around it, it’s no surprise that D4 is most well-known for its abundance of fresh seafood, with many of the city’s incoming fish hauls landing here first. Like District 3, it’s not too far from the centre of town to make you feel like you’re missing out on any action. Hop over one of the bridges into District 1 and you’ve got the whole thing on your doorstep. With a lively nightlife of its own, and some of the best local eats in Saigon, District 4 draws in plenty of locals, tourists and expats keen to see another side of the city. Vinh Khanh Street – This S-shaped road snakes through the heart of D4 and is the place to be seen come nightfall. Lined up from one end to the other is an almost endless procession of kerbside restaurants and eateries, offering everything from local seafood creations to sushi and hamburgers and hot dogs. Look out for street performers, magicians and singers who crawl the strip each night, dropping in on every restaurant in search of tips. It’s all good-natured though, and if what’s on show doesn’t appeal, simply don’t watch and wave your hand to say ‘no’ when the tip jar comes around. The Observatory, 5 Nguyen Tat Tan Street – Formerly located in District 1, The Observatory moved to this riverside location in 2015. With a regular lineup of live DJs and party nights, plus its late-night opening, The Observatory is one of the hottest dance venues Saigon has to offer. Until the 20th century, this area of Saigon was a small village that sat outside of the city limits, accessed via a long straight boulevard lined with trees and fields. The boulevard and the trees are still there, but the fields have been taken over by the city. District 5 abuts the south west border of District 1. For those in the backpacker area, it’s within easy reach by bus or taxi and is most famous for the enormous covered Binh Tay Market at its heart. Otherwise known as Cho Lon (meaning ‘big market’), District 5 is Saigon’s Chinatown, with rows of traditional Chinese shop houses snaking off in every direction and authentic Chinese restaurants and street food spots dotted throughout. District 5 is great for getting a feel for old-school Saigon while seeing Vietnam’s Chinese heritage up close and personal. First-time visitors should note that D5 takes a while to get to grips with, with so many backstreets and alleyways offering little more than the same local shops and houses. However, a little research and a map (or an organised walking tour) can revel numerous temples and Chinese assembly halls, incredible eateries and sprawling backstreet markets. Phu Dinh Street – An archetypal Cho Lon thoroughfare, offering everything from Chinese to French architecture, temples, shops and food carts. The Church of Saint Francis Xavier, 25 Hoc Lac Street – Located in the heart of Chinatown, this 19th-century building acts as a useful pivot point to explore the whole area. It is a striking piece of design and was famously the spot where former President Diem and his brother were captured in 1963 having fled the Presidential Palace as was (now the Ho Chi Minh City Museum) after a successful military coup. Banh Bao Ca Can, corner of Hung Vuong and Nguyen Tri Phuong Streets – For a taste of Chinatown, head to this award-winning steamed bun joint, in operation since before 1975. Filled with tender pork, eggs, meatballs and all manner of sweet and savoury delights, the buns here are legendary. The second of Saigon’s two main expat districts, 7 sits below Districts 4 and 2 in the far south of the city. The central development of Phu My Hung is home to international schools, numerous top-quality restaurants, spas, modern shopping malls, friendly cafes, open spaces and spacious residential developments. With easy access to other parts of the city via the large highway running through it, District 7 is another popular spot for international families looking to settle in Saigon. While it’s perhaps a little too far from the city centre for the average tourist wanting to see the sights, it does offer a nice mix of the old and the new, with more traditional sides of Vietnamese life still being played out in certain neighbourhoods. Depending on where you are, D7 can feel vastly different to the bedlam of D1, with hushed streets, clean air and a friendly, village-like vibe. The area plays host to the city’s annual “Conquer the Bridge” half marathon and regularly features community events such as the famous Saigon Flea Market at Boomarang Cafe. Being at the edge of town and serviced by the large highway, it’s also easy to slip into the countryside from here, either by heading south into the Can Gio mangrove forest, or west towards the lush Mekong Delta. SC Vivo City, 1058 Nguyen Van Linh – One of Saigon’s largest malls, Vivo City is loved by families from all districts. In addition to local and foreign brand shops, a vast array of dining options, an IMAX cinema, a supermarket, gym and language centre, this mall is also equipped with both indoor and outdoor playgrounds for the kids. Artinus 3D Art Museum, 02-04 Road 9, Him Lam Residence – Take a mind-bending look at the world with this interactive art gallery featuring altered-perspective 3D murals. The Chapel Cafe, 136 So 1, KDC Trung Son, Binh Chanh – Stunning architecture meets friendly cafe hangout at this glorious example of the D7 vibe. Set on a sleepy street dotted with cafes and restaurants overlooking yet another canal, this is an ideal spot to escape the city and unwind with a smoothie and a homemade pizza. Bordering Districts 1 and 3 in the north, Phu Nhuan is further from the centre than many tourists might appreciate, yet is becoming increasingly popular with long-term visitors keen to avoid the expat bubbles and settle into a more local way of life. Dotted with superb local diners, modern, well-equipped accommodation choices, and a variety of shops, life in Phu Nhuan can be very comfortable indeed. As the unofficial indie cafe capital of the city, it’s also great for friendly hangouts in interesting and unique caffeine-centred establishments. Phan Xich Long Street – This wide boulevard is the place to go for entertainment in Phu Nhuan District. A seemingly endless strip of restaurants, cafes, karaoke joints, shops, with dozens of side streets leading to more of the same, it’s the place to be seen on a Friday night and offers easy access to either end of the district. Vinh Nghien Pagoda, 339 Nam Ky Khoi Nghia Street – If you arrived in Saigon by plane, you probably passed this spot on your way into town. This huge pagoda complex was built in 1964 and is an ideal way to get a sense of Saigon’s Buddhist community. Not to be confused with Ben Thanh Market (which is in District 1), this large and sprawling corner of Saigon runs along the top of District 1, the two separated by the breezy Thi Nghi Canal. Sitting between Districts 1 and 2, Binh Thanh is on the rise as an area for both tourists and expats to settle, with the ‘best of both worlds’ appeal coupled with its own nightlife, entertainment and shopping options. Further north, Binh Thanh stretches into the more rural side of Saigon, taking in Thanh Da Island (formed by the tight curve of the river and a man-made canal cutting through the peninsular), a lush spread of peaceful rice paddies and lotus fields, where ducks and dogs waddle across narrow, dusty lanes as bright white cranes fly overhead. Canal-side fun – The Thi Nghi canal runs through several of Saigon’s districts, weaving an eight-kilometre route from the Saigon River to the airport. Transformed from a dirty, slum-lined creek through a multi-million dollar urban development project, the canal is now a positive focal point for the communities living on its banks. With smooth, traffic-free footpaths along its edge, plus trees, manicured gardens and exercise facilities along the entire route, it doesn’t matter where you pick it up, however the Binh Thanh segment is particularly picturesque (by Saigon standards), featuring countless indoor and outdoor restaurants and cafes (plus the American barbecue and craft beer institution that is Quan Ut Ut). After functioning as a place to catch up on the latest gossip while getting a dose of exercise by day, the whole area comes alive at night and is guaranteed to keep you coming back time and again. Van Thanh Park, 48/10 Dien Bien Phu Highway – As one of Saigon’s largest public parks, and one of its prettiest, Van Thanh is a popular spot for families, offering large expanses of grass for the kids to play on, private barbecue areas for rent, a child-friendly swimming pool, plenty of shade, and a thatch-roofed restaurant on the banks of its lake. The limits of Ho Chi Minh City stretch right out into the countryside, to within a stone’s throw of the Cambodian border in one direction, and down to the shores of the South China Sea in the other. Each and every district has something new and unique to offer. If you want a more rural life, a more back-to-basics experience where the heady sights and sounds of District 1 are still within reach, don’t be afraid to venture beyond the districts listed here; sometimes the best adventures, the most rewarding experiences, and the most memorable moments, are the ones your make for yourself. Hi Simon. First, thank all the information you share with the readers. It is certainly very valuable and of great help. I want to ask you a question. I am a photographer and I like to discover the most authentic part of the city, outside the tourist circuits. I read what you said about exploring old apartment buildings. Can you give me more information? Where are these blocks?